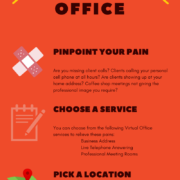 What is a Virtual Office Business Address? 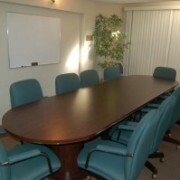 A Virtual Office can be comprised of a Business Address, Telephone Service, and Meeting Rooms. It will provide you with a combination of beneficial services that provide a professional business image at an affordable price. The landscape of small business continues to change as technology enables us to be more mobile. As a result, we are no longer tied to an office 8 hours a day and, in some cases, a traditional “office” is no longer a requirement. However, being home based or mobile does not mean that you have to sacrifice a professional image. The first thing to consider is whether using your home address as your registered office is a good choice. Most people who work from home do not expect clients to visit them there. In the past, it was more difficult for someone to locate you. Now, they type your address in the search bar and are presented with a picture of the front of your home. Advertising – A Virtual Office Business Address service will provide you with a professional, searchable street address for you to use in advertising. This is preferred to providing no address, a P.O. Box, or your home address. This is also an inexpensive way to test new market areas. Mail & Deliveries – You are able to receive mail and have packages shipped to that address. This will help you to avoid chasing down a package or waiting for a re-delivery attempt. You can also have clients pick up and drop off from this address. On-Site Staff – When a client visits the location, they will be greeted by a friendly receptionist and directed per your instructions. This leads to the next Virtual Office Service of on-demand Meeting Rooms. We will discuss this in our next post. https://winterparkofficecenters.com/wp-content/uploads/2013/04/Virtual-Office-300x236.jpg 236 300 Jessica Mostyn https://winterparkofficecenters.com/wp-content/uploads/2015/10/16701-Logo-Horizontal-FINAL.jpg Jessica Mostyn2017-03-15 10:52:422018-06-27 13:51:59What is a Virtual Office Business Address? What is a Virtual Office Meeting Room? Benefits of a temporary office What is a Virtual Office Meeting Room?